Could I eat a la carte in Orobianco? Currently, our gastronomic offer is based on two tasting menus: Autumn Suggestions, with 5 steps and Global Experience, with 9. In addition, on Fridays we also offer a third tasting menu: Green Friday, which is 100% vegetarian and changes every week. Apart from the menus, there is the option to select some special dishes, chef’s suggestions, from the menus and order them independently. How much time is necessary to enjoy the tasting menu? We recommend having between 1 hour and 2 hours and a half, depending on the chosen menu. Do you offer wine pairing? Yes, and it is an option that we recommend, because the experience is more global, always guided by our Sommelier, but you can also choose to see our wine menu and order wine by glass or by bottles or any other type of beverage, both alcoholic and non-alcoholic. What is the best route to get to Orobianco? Whether you come from Valencia or Alicante, the road you must follow is the N-332. 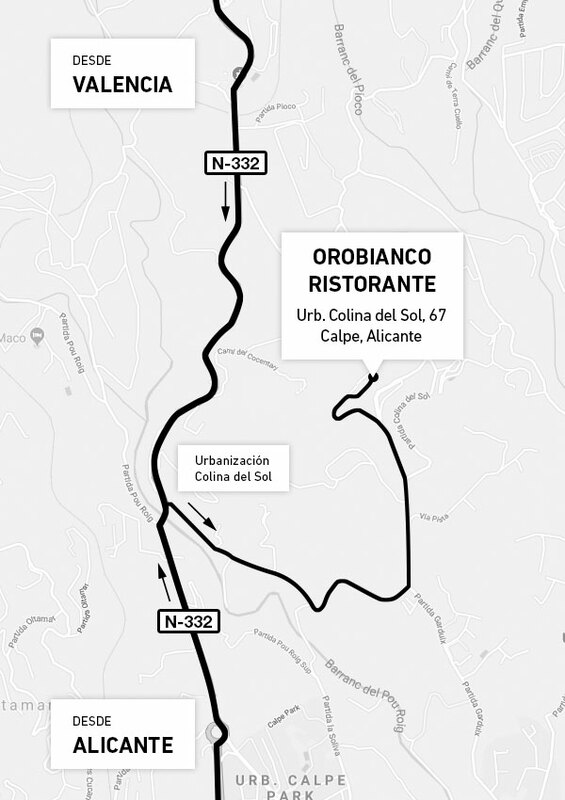 In the attached images you can see exactly the road you must take, following the signs of Urbanización Colina del Sol and, later, those ones of Orobianco Ristorante. I want to reserve a table on the terrace. How can I do it? If you make the reservation online, you can indicate it on the reservation form, or if you make the reservation by phone, indicating it to our team, although it is a request based on our availability, so we can not assure you at the time of booking that we go to have a table on the terrace. Could we smoke on the terrace? No. We have an designated smoking area outside. Could we go with children? Of course! Although it is advisable to tell us when making the reservation to be able to take it into account. Can I go with the baby cart? Yes, although we advise you to tell us when you make the reservation, to take it into account and assign them a table with enough space. Yes. We have two options: complete children’s menu (€ 24) or a pasta dish (€ 12). I am celiac or dairy allergic or lactose intolerant. Could I order the tasting menu? Sure! You only have to indicate it when making the reservation or to our room team, who will always ask you when you sit down at your table. I am vegetarian, vegan or raw vegan. Is it possible to adapt the tasting menu? Yes! We only need that, at the time of booking, you indicate that to be able to take it into account. We can also propose alternative options to customers who do not eat red meat or some specific foods. Could I take photos and videos? Of course! And we will love it if you share them on social networks or on Trip Advisor. Can I make a reservation for a group? For the structure of our room and the size of our tables, we accept reservations of up to 8 people, but if your group is bigger, you just have to tell us so we can propose an alternative option. Yes, through the same way by which you have made the reservation. Do you accept all credit and debit cards? Is there an specific dress code? No, but we recommend our clients to avoid clothing such as flip flops or sportswear. Could I have Orobianco's global gastronomic experience in a gift card? Yes. We have two experiences to give as a gift: the gastronomic experience, which consists of our 5-step menu (with or without pairing) or Sleep in Orobianco, our gastropack that adds a night of accommodation for two people to the tasting menu. You can do this by previously booking through the Experiences tab on our website or by phone. To confirm your reservation, we will ask you to make a transfer for the amount indicated. Could I sleep in the same residential area where Orobianco is located? Yes, making a prior reservation of our Gastropack: an experience that combines tasting menu and accommodation for two people.